So, you’re either not too happy with the stock earbuds that came lovingly, generically shipped alongside whichever device you’ve just happened to buy, or, more likely, they’ve randomly decided to stop working and you’re in the market for a new pair to take their place. Either way, unless you’re looking for an especially low cost, more disposable solution, the likelihood is that you’re going to want to start with the ~$50 price point. It’s here that you’re essentially guaranteed to be able to find something which will outperform your stock earbuds, so let’s dive into what this category has to offer. A sleeker design than many competing products at this price-point. Precision fit earbuds which add to the listening experience. The cable/pouch combination makes for great, tangle-free portability. Some may be turned-off by the lack of volume controls. The sound quality could be a little more balanced. 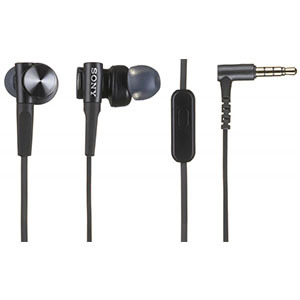 Sony has always had a strong presence in the earbud game. Their models have dominated the market long before most of the current brands even entered the race. With that said, it doesn’t come as shock that Sony MDR-XB50AP Extra Bass Earbuds is considered to be one of the best earbuds you can get at the moment. As it turns out, these offer a lot. The first thing that we noticed is the design. While it looks quite odd, we can assure you that Sony has put function over form on this one. The fit is great and using these on a daily basis is quite comfortable. On top of that, the performance is also quite impressive. There is plenty of low end saturation and that is just the beginning. A fantastic sound quality across a wide range of tracks. Sleek, no nonsense design that doesn’t draw attention to itself. A carrying pouch often comes in handy. Lacking in features, but it’s a mostly fair trade for sound quality. A coherent, sporty design that does what it says on the tin. Inline remote and integrated microphone are perfect for working-out. Earbuds come in all kinds of shapes and sizes, that much is well known. However, when you run upon something that looks like SOL Republic Relays Sport, chances are that you will stop for a moment to scratch your head. SOL Republic is one of the few brands who took the leap and altered the currently accepted earbud design. The results are impressive. You are getting a much better fitting set of earbuds that won’t drop out even if you go for jog. As a matter of fact, the whole point of this particular design is to make SOL Republic Relays Sport suitable for active, fitness oriented users. In terms of performance, these offer a great sound stage with plenty of width throughout the entire frequency response range. A refreshing design that combines functionality and aesthetics in a simple package. Larger drivers combined with a more robust chassis ensures a good performance. Plenty of low end girth which will appeal to anyone looking for extra bass. The only thing that is missing here is a better selection of silicone pieces. One thing that most earbud users are looking for is definition and range. that often goes against what a good majority of brands are offering these days. However, most doesn’t mean all. Tunai Creative Drum represent an answer to this issue that both works great and looks just as good. Tunai has selected great hardware and found a functional design to pack it all into. The driver housing is large, which was necessary in order to accommodate the additional hardware. In terms of aesthetics, you have few options on the table, although the whole design is quite stealthy. When it comes to performance, things are much more interesting. The response is great no matter which part of the range you look at, while there is plenty of girth overall. Compact, stylish but overall stealthy design makes this a perfect exercise companion. Despite their lower price point, these are packed with all kinds of awesome features. Great sound profile that works well with a variety of music genres. Good battery life combined with fast charging makes these a great choice for outdoor use. Earlobe hooks, although effective and functional, can be limiting in terms of comfort. Wireless earbuds are becoming more and more popular these days. That’s partially due to their inherent functionality but also the fact that smart phones are slowly getting rid of the 3.5mm jack. TaoTronics has been making great wireless models for a long time, which is evident when you look at this particular set. Sporty in design, these are about as sleek as it gets. The design and build quality is impressive to say the least. From the ergonomic earlobe hook to the magnetic back plate, TaoTronics Wireless Earbuds have taken care of it all. 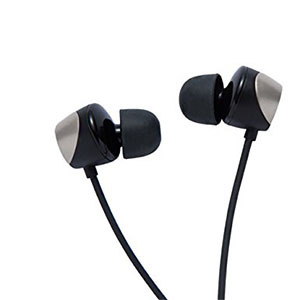 Most importantly, these offer quite a decent sound quality which you can enjoy for up to 9 hours per battery charge. Speaking of which, it takes only a couple of hours to fully charge these. Simple yet durable design combines great aesthetics and compact format. Hybrid drivers ensure a good sound optimized for both music and gaming. Braided cable reduces the risk of tangling and cable damage in the long run. These come with plenty of accessories which makes them compatible with multiple platforms. The only thing that we would like to see gone are those LEDs. Gaming and earbuds aren’t really the words we see that often. Even so, Chalked has shown us that you can find a good set of gaming earbuds. Despite their niche application, Chalked Hi-Res Earbuds have proven to be quite competitive when put to normal use as well. One thing that’s a tell tale sign of their nature are the speaker chassis with illuminated back plates. Once you get past the somewhat gimmicky exterior, you will run into a well balanced set of hardware that does a great job at delivering the necessary standards of performance. These are incredibly smooth with an extended lower end. However, they are also fairly tight in all the right places. Along with decent noise reduction solutions, you are generally looking at a great overall performance. Pretty solid sound that is well balanced across the frequency range. The only gripe we have is the position of the mic on the cable. Stylish headphones are generally looked down on for a number of reasons. Most find them to be all about aesthetics while completely disregarding performance. Not only is that not true in general, but models such as Symphonized XTC 2.0 completely disprove this misconception. 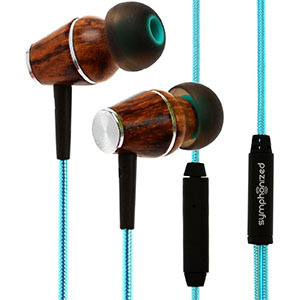 These earbuds are easily one of the best looking ones you can get overall, but especially at this price range. You are looking at real wood speaker housing that is meticulously crafted for optimal fit and comfort. Symphonized offers a number of different choices of wood as well as cable designs. In terms of performance, XTC 2.0 delivers a great sonic experience that is full of rich lows, meaty mid range response and a very accurate treble section. Audiophiles will love these for sure. Comfortable over the ear design ensures plenty of grip and good fit. Impressive build quality with a number of reinforcements in all the right places. Good quality microphone paired with tactile in-line controls makes this set very functional. A good set of accessories ensure a great overall experience. Speaking of alternative designs, we have to include one of more unusual earbud models available on the market. 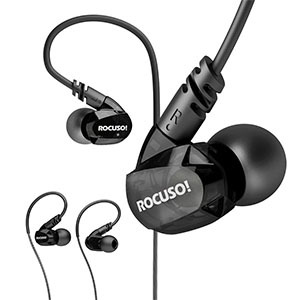 Rocuso GLE300 has combined great performance with even better functionality. These over the ear earbuds are meant to meet the needs of active users who are dedicated to fitness but also appreciate a good sound. Water resistant and highly durable, GLE300 tend to exceed those needs. What is really impressive about these is their ability to produce a very balanced sound. We aren’t just talking about a decent sound profile. No, these are really blurring the border between earbuds and more serious solutions. On top of all that you also get a quality microphone that is every bit as reliable, durable and good as the drivers we have just talked about. Are $50 Earbuds Worth The Investment? Earbuds are generally not considered an item that you want to sink a lot of money into. This leads many to wonder if investing in a $50 pair of earbuds is even worth it? In this segment of our guide we will try to answer that question to the best of our abilities. The first thing you need to decide is whether your current earbuds are meeting your needs. These needs can be divided into volume, low end saturation and overall clarity. Are your $6 earbuds good enough? Chances are that your answer is going to be a solid NO otherwise you wouldn’t be reading this right now. 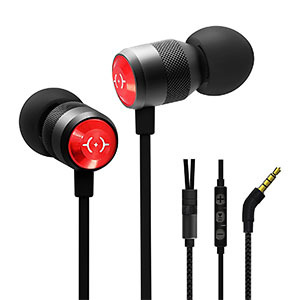 The idea behind shopping for higher end earbuds is to find a middle ground between the general functionality as well as practical value of earbuds and the sound quality of headphones. 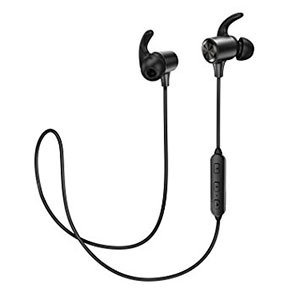 Most earbuds users who are used to dealing with cheap earbuds aren’t even aware how good of a sound you can get from these if you decide to spend a few bucks more. To be quite honest, investing in a decent set of earbuds isn’t only worth it, but it is a much smarter investment than going through half a dozen cheap ones. Unlike the $20 price point, audio quality is a lot more consistent across the board once you start heading closer to a $50 expense. This somewhat takes the pressure off, allowing you to focus on things like features, specific device compatibility, and even allows you more choice when it comes to the array of designs on offer. All good things, right? It’s at this stage that the majority of mainstream offerings could reasonably be described as holding their own relative to the primary stock offerings from most large phone manufacturers. While you may not get something as visually iconic as Apple’s own earbuds, it should be no big deal to find a device which sounds better and, often, offers more alongside that already noteworthy improvement to your listening experience. The main thing to keep an eye out for here is that you aren’t settling for less than stock earbuds. The overwhelming majority of offerings will come with the classic integrated mic and inline remote control combo, but if you’re used to, say, Apple’s earbuds with their three button remote, you may want to ensure that you aren’t ‘downgrading’ to the one button remote which a couple of brands offer at this price point. It’s certainly not a deal breaker, but losing volume control can feel like a net loss even if you get a slight improvement to audio quality. While there are a couple of wireless offerings at and around this price point, these are still an immense rarity and will generally require you to make significant trade offs in the form of low battery life, poor fit, or an otherwise subpar experience. 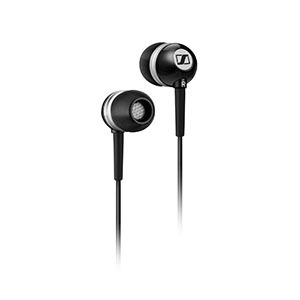 Design is a fairly variable proposition when it comes to in-ear headphones at around this price. Some manufacturers (we’re looking at you, Bose) have taken a fairly minimalistic approach and instead put their resources into delivering in other areas. Others try their best to give you a marriage of form and function, but some, of course, will inevitably therefore fail to deliver on both in that ‘jack of all trades, master of none’ fashion. One of the best things about shopping in the $50 range is the abundance of options. Not only are you going to see more choices when it comes to specific sound profiles, but you will also find earbuds which are designed to fit rather specific applications. Fore example, there are earbuds designed for fitness oriented users. Such earbuds have a slightly different design compared to what we usually see on the market. While necessary, some users even prefer this look over the more classic earbud aesthetic. Aside from performance oriented designs, there is a lot of earbuds whose main purpose is to meet certain aesthetic goals. The result is a huge number of rather stylish models which are mostly performing quite well. You are able to find a model that best fits you and your lifestyle and use those earbuds as a fashion accessory on top of its main purpose. As we’ve said, you want to take stock of your own priorities and ensure that you aren’t going to feel like you’ve made a step in the wrong direction by transitioning from a pre-packaged option to the not inconsiderable investment in a device of your own choosing. This means deciding on how much you prioritize features like a three button remote, how important it is to you that the earbuds you end up with look the part, the extent to which you care about things like custom eartips and carry cases, and, most importantly, how all of the aforementioned considerations hold up in relation to the actual listening experience. This can be a fairly daunting task, so we’re here to help. Our first order of business would be to find earbuds that have a solid set of drivers in them. After all, what is the point of spending more on earbuds if you won’t witness a significant performance boost? What is on the same level as performance is comfort. You can’t really be sure how comfortable a set of earbuds is going to be unless you try them on. 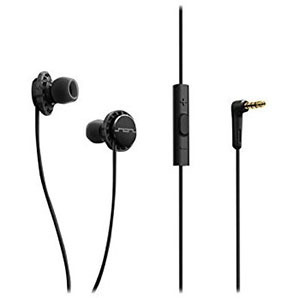 However, you can minimize the risk of a bad fit by searching for earbuds that come with a number of earpieces included in the package. This way you are more or less guaranteed to find a good set that will make the earbuds fit perfectly. After you have covered these two core requirements, you can start looking at features. The ~$50 price range is where you really start to be presented with meaningful options, and it’s vital that you do the research in order to ensure that you are fully equipped with your own, individual priorities before going ahead with your purchase.